From the title, I expected this to be another devotional book full of short bits of imparted wisdom from the author. It is refreshingly so much more! Author Mark DeMoss is founder and president of the DeMoss Group, a public relations firm serving Christian organizations. 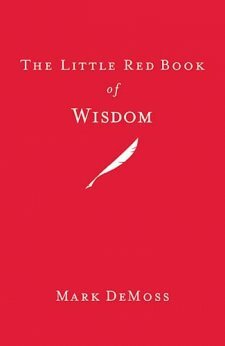 In The Little Red book Of Wisdom, DeMoss basically relates his life story and lessons learned in order to to help others in their life journey. His purpose in writing this book can be summed up in a statement he makes in the Preface: “If only one copy existed, it would be for my three children: Georgia, Mookie (his nickname since he was an infant), and Madison. If these words help them on their paths through life, it will be worth every hour of writing.” Thankfully he published this writing so others, myself included, can benefit from his lessons learned. DeMoss is boldly Christian. Throughout the book he points to God’s working in his life as the reason for his success. He lists his study of the Bible, specifically reading one chapter from the book of Proverbs daily for about half of his life, as one of the reasons he is “qualified” to write a book on wisdom. The final chapter of the book is fully devoted to presenting what he calls “the wisest decision anyone can make” – securing one’s eternal destiny with a personal relationship God through with Jesus Christ. He explains very simply how and why to trust Jesus for salvation, including an example prayer to aid in making that choice. He then continues to invite the reader to write to him, including his address, to relate that decision. I feel I should be the one reading it before anyone else. Interesting book and dedication I think.